The Death of Magic. This was the subtitle to my story “Erowenowe,” which I had written sometime during November 2014. It was part of my NaNoWriMo anthology: an attempt to write one story a day for one month. It was a burdensome challenge, but this post is not about the writing. It’s about the story. The Death of Magic. Erowenowe (Erowen for short) was a young maiden chosen for sacrifice to the sun god: The kingdom’s fertility had begun to wane, and the gods, they feared, had stopped listening. In actuality, they were not wrong: Following the end of the War of Fallen Stars (on which I wrote the beginning in my 2012 NaNoWriMo story, Starfall), the pantheon vowed to never meddle in the affairs of men again (a bit akin to Tolkien, I suppose, but he has always been a key inspirer for me)–and their absence, indeed, preluded the death of magic. I feel the same sense of waning power as I write this as when I wrote Erowenowe. Seven years ago today, I began the Writingwolf. It has grown so much in these seven years, and I have grown and evolved alongside (and at times because of) it. And since I joined Teach for America and started my training as a teacher, and then started teaching, the Writingwolf has been written silent: no words, no muffled howl, has escaped its muzzle. Writing has been, is, and always will be my greatest passion and my biggest dream, but the responsibility of maintaining a blog–one enlivened by my readers for whom consistency and attention is one of the few ways I have to show them my respect and regard–requires more of my time than I am able to commit at present. I’m still learning to lesson plan efficiently. I’m still learning to manage a classroom skillfully. I’m still learning, quite literally, what it means to be a teacher (and I’m in grad school to prove it). Writing, I’m afraid, has been pushed out of my circle of priorities. This will not always be the case, but for the next six months, maybe even the next twelve or possibly eighteen until I finish my graduate program, keeping an regularly active blog seems as though it’s one responsibility too many. There is power is holding high expectations; but there is equal danger in clinging to unrealistic expectations. One of the many unfortunate realities of teaching is that a handful of my kids will not graduate the ninth grade, and when our advisory moves on to the tenth grade next fall, they will not be joining us. For this small handful of students, my task now is not only to help them be as successful in the next six months as possible, but also prepare them to move on to another school or another advisory without me. Of course, I cannot change any person, let alone an adamant and strong-willed ninth grader, and I am certainly not the sole bearer of their future potential, but I feel it is imperative that I bestow upon these boys (by which I mean, help them to develop the qualities they already possess, somewhere inside them) the mindsets and skills that I never had when I was their age. It took me many setbacks and failures and risky choices that may have had life-changing consequences for me to learn these things, and while it’s very likely that such lasting impressions can only be learned while wading through the fire (that same fate destined for Erowenowe, to be burned in sacrifice for brighter days), I believe I can at least provide them a strong foundation so even if they do not master these skills before they need them, when the time comes, they may remember these lessons and crash a little more softly, burn a little less brightly when they fail and fall and begin to fly again. I say this because one of the activities I want to facilitate fits perfectly with the theme of this post. I want to come to class one day with a bucket of rocks. I want to ask each student to pick up one rock and hold it as tightly as he can. At first it’ll be easy–it’s just a rock, after all, hardly a few ounces heavy, barely the size of their palms. But as they hold it longer, the muscles in their hands will begin to ache and they’ll begin to feel the fatigue of holding on too tightly. I won’t stop here, nor will they: I’ll ask them instead to pick a second rock and hold it as tightly in their other hand as they can. While their second hand begins to tire, their first hand will begin to scream. And misery is best comforted with company, so I’ll ask them to do one final thing–something I know with certainty each of them can be successful with (under normal circumstances): I’ll ask them to write their names as neatly as possible without releasing the rocks in their hands. Inevitably, they will, as I would, as you would, fail to perform this simple task. So then I’ll ask them to set their pencils down (for those who managed to pick them up) and open their hands. Having clenched down upon those rocks for so long, their fingers will creak as they’re slowly peeled away, muscles locked in place protesting to remain, because by now holding on has become the norm, and letting go isn’t easy to do. But once they’ve let go, once they’ve taken that first step, the blood of life rushes back to their fingertips, bringing with it fresh oxygen to sate the stomachs of every cell, sweeping aside the buildup of lactic acid and carbon dioxide that come naturally, but erode our capabilities. Within a few moments the stress and strain of clinging too tightly will pass, and when they reach for that pencil or pen, their names will flow forth upon the page like rivers of milk and honey raining down from the holiest of holy lands. It isn’t easy to let go. It isn’t easy to watch the magic wither and die. But sometimes it’s necessary to open our hands, flex our fingers, and feel again. Sometimes it’s necessary to succumb to science over the mysteries of magic. For now, my path has led me away from the Writingwolf, but no matter where my words and wonders take me, I will always be the Writingwolf, and in time my path will bring me back, reborn through my wanders, borne of new words and new stories to share. We all (probably) know the abbreviation tl;dr, meaning “too long; didn’t read.” This last week inspired another: tb;dw, meaning “too busy, didn’t write.” It’s a habitual occurrence when classes begin, but it’s a habit I want to break. The truth is, when I decided somewhat arbitrarily to make Mondays and Thursdays my Writingwolf days, I had no idea that I would have homework due every week on Tuesdays and Fridays. It’s a match made in priorities hell: either I maintain my blog (part of my overall vision and one way of staying sane), or I commit myself to excelling on homework (a different part of my overall vision and another important part of staying sane). Clearly, you can see my predicament. Since I can’t change my homework schedule, it means I can only change my posting habits. At the moment, I’m thinking I’m going to switch it up so I blog on Tuesdays and Fridays, and then share poems/stories/etc. on Silent Sol Wednesdays and Saturdays. But it’s a process. In fact, as we speak I’m in the process of creating new processes–I’ve done away with making goals for myself (hence why I haven’t written a piece on my goal progress in a while), instead attempting to create daily habits that will help me achieve the long-term outcomes I want to realize. Goals, in a way, are a recipe for failure, whereas processes appear far more forgiving. But before I report on my progress and how it’s working for me, I need to keep up with it long enough to see some burgeoning results. So my post on goals vs. systems is forthcoming, I promise. In the meantime (which, pausing to reflect, literally means the midpoint between now and some unspecified future moment), I’m going to try this new schedule and hope it helps. It’s about that time of year when suddenly I disappear. No, I’m not a practicing magician, but I am still a college student, and with the summer days winding away, within a week I’ll be back on campus, back in classes, trying to figure out how they expect us students to do what students are meant to do. And typically it means my blogging starts to suffer. But I’m hoping, even if there might be some disruption next week, I’m hoping that I’ll be able to keep up my twice-weekly posting on Mondays and Thursdays here, and on Tuesdays and Fridays on Silent Soliloquy. I have a number of unpublished posts that I think will help me through this transition, but transitions of any sort tend to messy and unruly, and until I‘m in the midst of the forthcoming chaos, I probably won’t realize how much a whirlwind it’s going to be. So all my blogging friends, all my readers, riddle me this: How do you keep up with what you love (perhaps blogging, perhaps not) when the going gets tough? What’s your method, what’s your madness? Because this time, when it gets tough, I don’t want to get going. 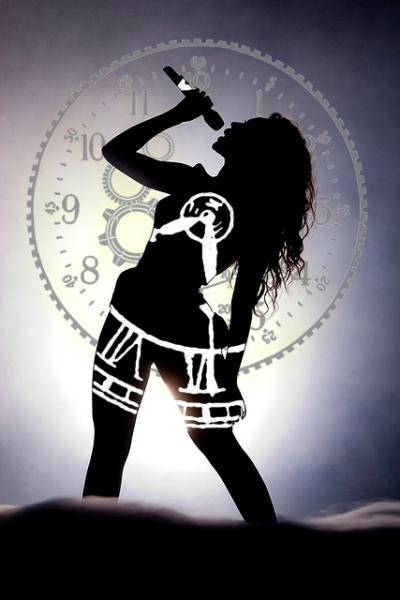 I just finished reading a time-management article that reminded its readers that “You have just as many hours in the day as Beyoncé.” While this is scientifically true and simple enough to entertain mild minds, it neglects the fact that Beyoncé (in fact, most celebrities) have a few extra things going for them that the average person doesn’t. So here’s five reasons why I’m not as productive as Beyoncé (and neither are you). I was out with friends watching Interstellar the other night. Afterwards we were standing around, trying to figure out the movie, some of us closer to understanding than others. I was one of these guys, trying to explain multiple dimensions to people who have never had to think outside three (and even had a hard time understanding those). But I tried to take it further, make it clearer: dimension is not only a spatial measurement. We think of space in three dimensions: we can move forward/backward, left/right, and up/down–three measures, three dimensions. So what, they asked, is four dimensional? It may seem like this will be a post about science, but hold on. Shortly, it won’t be. To the person who stole my wallet yesterday while on the subway in Mexico City with my fiance, I’m sorry. I don’t know why you felt the need to reach into my pocket as the crowd shoved its way into the train car and take what was not yours, but I pray there was a good reason–perhaps your kids are starving and you can’t find a job, perhaps a loved one is sick, perhaps you never learned the difference between right and wrong. For each of these things, you cannot be blamed, and I am sorry. I really did think today was off to a good start–but if this semester has taught me one thing, and one thing only, it’s that every day that starts out too good to be true won’t be true for very much longer. It’s been a while since I’ve checked in on my goals this year–but mostly that’s because I’ve been keeping to them well and I haven’t had much to write about. Now that I’ve achieved a few of them and the summer is about to start, it seems fitting to look at them once more.